We bring forth a range of Aluminum Bottles that are especially designed using modern technology. Made from quality assured materials, our range meets the attributes set by varied quality norms. Recognized for their superior finishing, durability and leak proof, these are available with customized solutions. Our range finds application in various commercial as well as industrial areas. 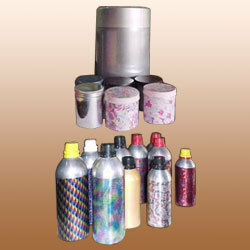 We are recognized manufacturers and exporters of comprehensive range of Aluminum Coated Containers. These are accurately coated with aluminum to give them premium finishing. These are offered in the markets in various sizes and capacities as per the specifications of our valued clients. These are known for their excellent corrosion resistance, longer serviceability and dimensional accuracy. We deliver them at the industry leading prices within stipulated time frame. 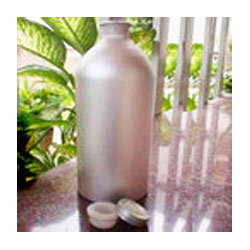 We manufacture and export a wide range of Aluminum Storage Bottles using latest manufacturing facility from quality tested raw materials. Checked on different parameters, our range fulfills the parameters defied by varied quality standards. Our range is availed in the markets in various sizes and capacities as per the details provided by our clients. It is fitted with a plastic HDPE screw cap with a PVC / LDPE washer as the closure. Our collection is appreciated for its longer shelf life, corrosion resistance and leakage proof.